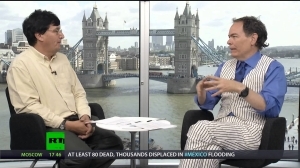 In this episode of the Keiser Report, Max Keiser and Stacy Herbert, discuss the bandits, banksters and brokers who will have taken all that we have got. No dollar, euro, yen or drachma will be left behind. 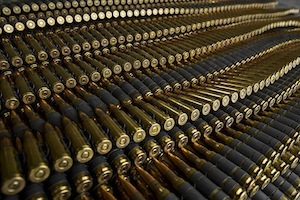 And inflation, deflation and confiscation will take every last nickel and dime. They also discuss Americans turning their bodies into cash machines as they start selling off various organs to make ends meet. In the second half, Max interviews economist and professor, Constantin Gurdgiev, about Bail-Ins, Bail-outs and Troikas. They also discuss ‘second-rate’ Britain and a de-Americanizing rest of the world. 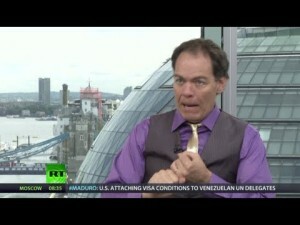 In this episode of the Keiser Report, Max Keiser and Stacy Herbert, discuss the paradox of negative side effects warnings driving an increase in sales to consumer chumps and how this applies to David Cameron’s economic policy of a housing ponzi scheme. In the second half, Max interviews Satyajit Das, author of Extreme Money, about QE Forever as the Strawberry Fields of our day and about terming out the debt in Europe until eventually we have 99 year loans paying zero percent interest. And, finally, they discuss the reality that we are living in a hedge fund world operating on the tactic that too big to fail banks are now the equivalent to sovereigns. In this episode of the Keiser Report, Max Keiser and Stacy Herbert, discuss whether banking bonus outrage is equivalent to the lynching of African Americans in the Deep South and the money, money, money, MONEY! of the ex-Presidents of the United States. In the second half, Max interviews George Galloway, a Member of Parliament, about his documentary film, The Killing of Tony Blair. They also discuss crowd funding democracy with Galloway’s run for Mayor of London. In this episode of the Keiser Report, Max Keiser and Stacy Herbert discuss flamethrowers and jihadis in the banking world. They also note that houses in London earn more per day than the average worker in London. In the second half, Max interviews Mitch Feierstein of PlanetPonzi.com about the Fed’s balance sheet, housing bubbles around the world and putting lipstick on pigs. Max Keiser and Stacy Herbert discuss economic espionage and, perhaps, sabotage by the NSA against the corporations and innovators of competitor nations. In the second half, Max interviews author, journalist and filmmaker, Greg Palast of GregPalast.com, about the Larry Summers’ secret ‘End Game’ memo and the decriminalization of what were once financial crimes.